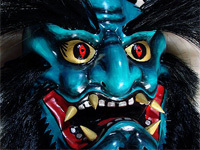 Painstakingly made by craftsmen, each mask takes weeks to make with dozens of stages. The base is 9 layers of washi, layered with multiple coats of kofun (ground seashell), various traditional inks and pigments, and finally varnish. Size: 50 x 40 x 20 cms. Material: Washi paper, sea shell, ink, pigment, hair. Teeth are hand carved from wood. The hair is sometimes synthetic, sometimes horse, sometimes human. 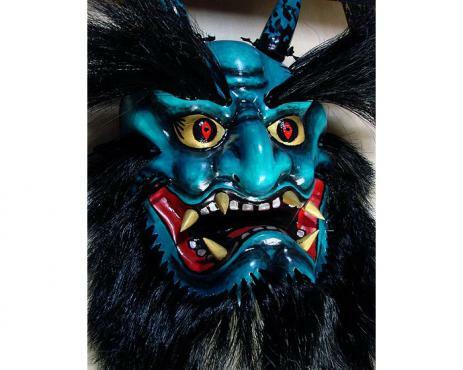 Note: From time the order is received, it takes the mask craftsman roughly 30 days to complete this mask.